In June of 2016, six teachers and 18 to 24 high school students from rural eastern Oregon communities will spend a week at Oregon’s newest and second largest state park, Cottonwood Canyon State Park in eastern Oregon, as part of the second session of the Cottonwood Crossing Summer Institute. Here they will perform field studies in natural resource education and return to their communities to build connections and interest in rural sustainability and natural resources. Teachers and students attending the six-day Summer Institute will spend most of their time outdoors: tent camping, outdoor cooking; and conducting field studies. Students will have access to laptop computers and video cameras to complete data analysis, and to create posters and other displays of their work. Participants will arrive on Sunday and be assigned to cohort groups. The organizing theme for 2016 is One Million Drops, during which the fate of a drop of water in the watershed is explored. The specific topic areas selected by participating teachers for the 2016 Institute are: macro-invertebrates; riparian areas and stream health; hydrology; and photography/writing. While the CCSI program is intended to serve the entire 10-county John Day Watershed, most of the students in the program are expected to come from adjoining Gilliam, Sherman and Wheeler counties. The Institute will be organized and led by a volunteer steering committee composed of representatives from Oregon Parks and Recreation, Oregon State Parks Foundation, Regional Solutions/Department of Environmental Quality, Classroom Without Walls and Eastern Oregon University/GO-STEM (Science Technology Engineering & Math) Hub. The latter two organizations are experienced providers of professional development for educators. Classroom Without Walls has been leading authentic outcomes-based learning experiences for teachers and students since 1994, and provides coursework and curriculum that spans an entire year including classroom planning and preparation for an outdoor field-based project, the field experience itself, and follow-up for data analysis and project completion in the classroom. utilize science practices (e.g., questioning, problem solving, data collection, etc.). and biology with natural resource experts and instructors from Eastern Oregon University. Cottonwood and within their own communities. their home community that will take place during the 2016-17 school year. What is the goal of CCSI? real community problems. GO-STEM will work directly with the instructors and teachers to support the integration of grade level content standards and the development of inquiry-based lessons that can be implemented in the classroom. Throughout this professional development experience, teachers will be immersed in a practicum that models place-based education. CCSI will use best practices for professional development by providing an experience that employs active learning; models strategies that teachers can implement with their students; and provides an experience that builds teacher’s knowledge and skills. Why is this project important for the John Day watershed community? their peers. They often teach several subjects and may be the only teacher of a particular content area at their school. CCSI will build a Professional Learning Community for teachers around the concept of place-based learning which integrates math content into authentic real-world applications. the natural environment while supporting the achievement of the Oregon Environmental Literacy Plan. The interactions that will take place also help address the economic challenges faced by ranching and farming communities in rural Oregon. Have you run this program before? 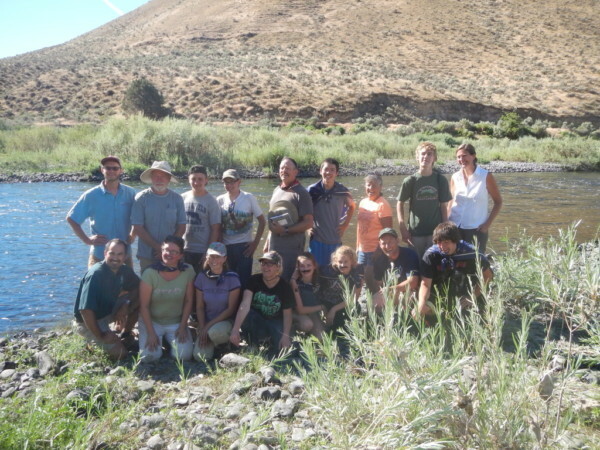 In June 2015, CCSI was successfully launched with 10 high school participants from Arlington, Condon, La Grande and Boise and five participating teachers from the John Day watershed. The students and their teachers camped out for five days and earned college credits while studying local plant species, archaeology, writing and photography. They also went rafting, gazed at stars, told stories, and held a chili cook-off. features within the park. Students learned how to take great care and practice responsible environmental stewardship when coming into contact with historic and prehistoric artifacts. comparisons to previous inventories to spot possible trends. What is the future of the Cottonwood Crossing Summer Institute?